A trick does not always go the way a magician planned it. Sometimes a card is missed, or the deck is dropped, or a spectator forgets his card. When these happen the magician has to do his or her best to muddle along. But with this card trick Secret Sandwich, there are three possible results to the end, and the magician is prepared for them all. The magician hands out a deck of cards and asks the spectator to freely choose one of them. The card is placed on the top of the deck, which is then cut and shuffled and cut once more. When the cards are given back to the magician he fans through them, and then cuts and shuffles them himself. When the spectator names their chosen card, the magician reveals its exact whereabouts. When cards are shuffled, they are not randomised very well. This and a secret peek at the top and bottom cards are the magician's secret weapons in Secret Sandwich. Only a regular deck of playing cards is required. No advance prep besides practice is needed, although the magician will need a peek at the top and bottom cards before handing the deck over. 1)	the magician shuffles and cuts a deck of cards, takes a peek at the top and bottom cards, and then hands it to a spectator. 2)	The spectator is asked to select a card from the middle of the deck and show it around to the audience. The card is placed on the top of the deck and then the spectator is asked to cut the deck, putting the chosen card back in the middle somewhere. 3)	To further challenge the magician the spectator is asked to give the cards a shuffle, and then cut them once more before handing them over to the magician. 4)	The magician then fans through the deck. Here is how he finds the cards. When the spectator placed his or her chosen card on the top, it was on top of a card the magician had memorized. When the deck is cut, it is now between two cards memorized by the magician - in a secret sandwich of cards. When the magician fans through the deck he looks for these two cards and notes the card in between. 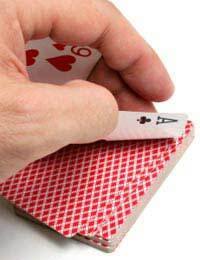 5)	The magician then cuts the deck so that the chosen card is on top and asks the spectator to name their card. He turns over the card and takes a bow. 6)	But what if there are two cards in the secret sandwich, thanks to the shuffle? No worries. The magician simply cuts between the cards, taking note of which ends up on top and which is on the bottom. If the named card is on top, the top card is turned over. If it is on the bottom, the deck is turned over. And what if there are THREE cards between the sandwich? This is rare, but could happen. Cut the first two to the top of the deck, and put the deck behind your back as you explain that it is sometimes easier to feel your way to the right card. Take the top card and put it reversed in the middle of the deck. If that card is named, spread the cards and show that the chosen card is reversed in the deck!